"In honor of Michael's 7 newly discovered Mayflower ancestors, we're offering Casefile Clues Thursday and Friday for $14 for a year of 52 issues. Here's a little about Casefile Clues and here's a little more." More info, including how to get sample copies, here. New England Historic Genealogical Society - The Bookstore at NEHGS is here to help with your holiday gift giving for the genealogist in your life - even if that's YOU! We've bundled some of our most popular titles and slashed the prices just in time for the holiday season. Find the perfect stocking stuffer with our list of gift ideas for under $15. Order online, through the mail or over the phone. Supplies are limited, so start shopping today! FamilyTree.com (brought to you by FamilyTreeMagazine) - Skip the Lines-Shop Online! Save 20% on your order! Enter offer code SFT133 when you check out before November 29. Be Sure to check out our Holiday Gift Section While You Shop! * Offer code SFT133 expires November 29, 2010 at 11:59 pm EST. Offer not valid on VIP program enrollment or renewal, subscriptions, or products that ship directly from the manufacturer. Registrants for the Salt Lake Institute of Genealogy will also receive free UGA membership ($35 value) and the UGA member discount ($40 discount) for a total value of $75/off the current price!! Classes are filling fast and will fill even faster with this deal. Register at www.ugagenealogy.com. Remember, the Salt Lake Institute of Genealogy will be January 10-14, 2011 at the Salt Lake Radisson. Instructors are the best in the nation and cover topics from advanced methodology to writing a family narrative, to technology. We are also offering location-specific courses in French and Irish research this year. Don't wait, we're not sure when they will be offered again. $100 Off a Y-DNA Kit from Genetreee - We're going all out this year for our Holiday Special! Y-46 tests for only $79.95! (That's a savings of $100.) A DNA test kit makes an extraordinary gift that won't be forgotten! Valid now through the Monday after Thanksgiving (Nov 18-29, 2010). Order at www.genetree.com. Get a World Collection Subscription to WorldVitalRecords.com PLUS 10% off any order at Historic Map Works for only $59.95. Save up to $50! The November 2010 Scanfest will take place here at AnceStories next Sunday, November 28th, from 11 AM to 2 PM, Pacific Standard Time. If you would like to be a Producer, please e-mail me no later than Saturday, November 27th at 4 PM, PST and I'll send you an invitation. Preference will given to previous Scanfesters. You must set up an account (free!) ahead of time to be a Producer. This account will be good for all future Scanfests. You can do some practices ahead of time by going to My Account and clicking on the link under Practice your live blogging. Again, you must have IE 6.0+ or Firefox 2.0+ to be a Panelist. PROVO, Utah, November 16, 2010 – Ancestry.com is pleased to announce it has created a strategic alliance with National Geographic Digital Media to help individuals make new discoveries in their family history. As part of the relationship, NationalGeographic.com will host a family history experience online, developed by Ancestry.com, which enables visitors to learn more about researching their genealogy and provides specific tools for them to search their ancestral roots located on the Genographic Project website. For anyone interested in learning more about their ancestors, or to experience the family history tools offered by Ancestry.com and National Geographic, visit http://bit.ly/ACOMonNatGeo. Ancestry.com Inc. (Nasdaq: ACOM) is the world's largest online family history resource, with more than one million paying subscribers. More than 6 billion records have been added to the site in the past 14 years. Ancestry users have created more than 20 million family trees containing over 2 billion profiles. Ancestry.com has local websites directed at nine countries that help people discover, preserve and share their family history, including its flagship Web site at www.ancestry.com. National Geographic Digital Media (NGDM) is the multimedia division of National Geographic Ventures, the wholly owned, taxable subsidiary of the National Geographic Society, one of the world’s largest education and scientific nonprofit organizations that works to inspire people to care about the planet. Holding many top industry awards, NGDM publishes Nationalgeographic.com; produces short-form video for broadcast markets; manages marketing and content partnerships across broadband, mobile, gaming and other consumer digital platforms; and provides video and film footage to commercial, theatrical, educational and other digital footage markets. Leading family history website www.findmypast.co.uk has been awarded the contract by the Plymouth and West Devon Record Office to digitise and publish online its family history records for the very first time, in an exclusive partnership. Findmypast.co.uk will work with FamilySearch International, the world's largest repository of genealogical records, to make the collection fully searchable online, making it easier than ever before to trace Devonshire ancestors. These records will be joining what is already one of the largest online collections of over 26 million parish records dating back 650 years at findmypast.co.uk. Today's announcement follows on just a few weeks after findmypast.co.uk published online over 223,000 transcripts of parish baptisms, marriages and burials from Devon Family History Society. Those transcripts will soon be matched up with the images of the original parish registers, to be supplied by the Plymouth and West Devon Record Office, enabling family and local historians to view facsimiles of the original historic documents online for the first time. FamilySearch will scan original images of the registers for findmypast.co.uk to then transcribe and make available and fully searchable online at findmypast.co.uk with an index search on FamilySearch.org. Nicola Moyle, City Curator of Plymouth and West Devon Record Office commented: "We are committed to making our archives much more accessible and easy to use. We're really excited to be working with findmypast.co.uk and FamilySearch to digitise these records so that they will be easily available to everyone at the simple click of a button." Debra Chatfield, Marketing Manager at findmypast.co.uk said: "We are extremely excited that the Plymouth and West Devon Record Office has chosen to make its family history collection available through findmypast.co.uk. Once these records are online, it will be possible for anyone to find out if they had Devon ancestors just by entering a surname in a search engine. They will then be able to see an image of the original parish register, which in some cases could be up to 650 years old." The online records will be free to access at the Plymouth and West Devon Record Office but will be chargeable if viewed from home or elsewhere, either by buying PayAsYouGo credits or included within a subscription to findmypast.co.uk. The Plymouth and West Devon Record Office is the principal archive repository within Plymouth and the West Devon area. It exists to collect and preserve the historical records of the area and to promote and encourage their use by all who want to study them. The Record Office holds records of the old borough and modern city of Plymouth, as well as the West Devon area. From 1 April 1998, it has been run as an independent archive service by Plymouth City Council and forms one of the services provided by the Community Services Department. The Record Office holds original records (archives) of many organisations and individuals. Dating from circa 1190, they include deeds, charters, minute books, letters, registers, manorial documents, reports, diaries, financial records, maps, plans, photographs, card indexes, microfilms and microfiche. The office is open Tuesday to Friday to view records and staff are happy to answer queries by telephone and email. FamilySearch is the largest genealogy organisation in the world. Millions of people use FamilySearch records, resources, and services to learn more about their family history. For over 100 years, FamilySearch has been actively gathering, preserving, and sharing genealogical records worldwide and operates over 4,500 family history centres in 70 countries, including the renowned Family History Library in Salt Lake City, Utah. London, England & Tel Aviv, Israel - November 18, 2010 - MyHeritage.com, the largest and fastest growing family network on the web, unveiled today a host of new online family tree chart designs and features. As the leading online source for family tree charts, with over 7,000 of them created every day by its users, MyHeritage.com has now completely revamped its offering to enable free customization, printing and sharing of beautiful family tree charts. Going one step further in enabling users to showcase their family history, MyHeritage.com launched today a professional poster printing service for any chart produced on the website, and added a new department specializing in the production of custom-tailored handmade family tree charts. More than 16 million families have created a site on MyHeritage.com; a private place for exploring family history, finding long-lost relatives and keeping in touch. Innovative tools, such as Smart Matching™ and photo sharing with facial recognition technology, provide a friendly and secure setting where millions of users have planted their family tree online. Users can now create a family tree chart from their family site in a few clicks, by choosing from numerous different chart types (click here to view), including the newly introduced Bowtie and Hourglass formats. The Hourglass chart shows the ancestors and descendants of a selected individual, in as many generations as desired. MyHeritage.com has further innovated on this format: its Hourglass charts can optionally include the ancestors of any spouse as well. The new Bowtie format showcases an immediate family with the ancestors of the two partners on either side. 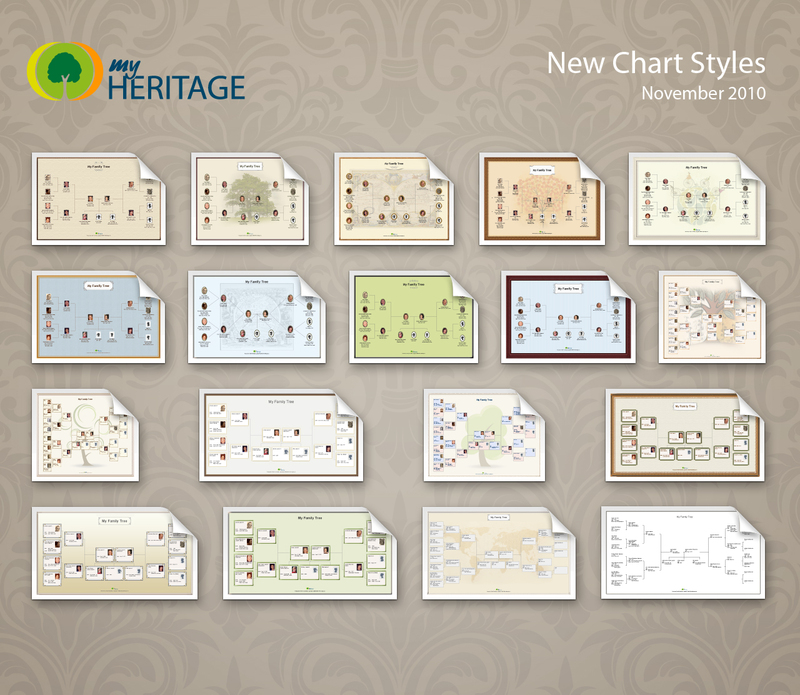 With a choice of 18 different predefined chart styles (click here to view), plus a wide variety of border designs, frames, background images, decorations, colors and fonts, users enjoy thousands of combinations for personalizing their family tree charts. Users can further customize their chart by choosing which information they wish to include in their family chart - from names, birthdates or wedding anniversaries - through personal photos and personal notes - to entire biographical data on family members. MyHeritage.com offers high resolution export of charts completely free of charge, to enable sharing with other family members and friends. Users can generate all charts in PDF format, which is compatible with every home printer and enables easy sharing as an email attachment. As of today, MyHeritage.com adds a professional poster printing service for any chart produced on the website, starting as low as $20 per poster. With worldwide shipping, any user can now order a high quality printout of their chart packaged in a protective tube, either directly to their home or shipped as a gift to any other address. The print can be ordered on a variety of paper types (including standard paper, matt photo, glossy photo, vinyl and canvas), in almost any size and with optional lamination. For special occasions like family reunions, posters can be as large as an entire wall. In addition to the automatically generated charts and posters, MyHeritage.com is launching today exclusive handmade charts (click here to view). These special charts, each a unique creation, make an ideal present for a family reunion, anniversary or other special occasion, and are also an heirloom for future generations. 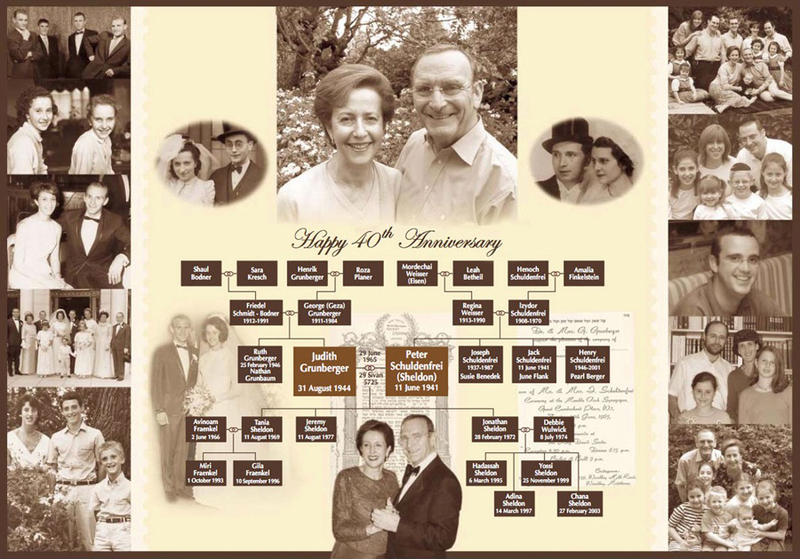 A dedicated team at MyHeritage.com has been set up to prepare these impressive custom-made family tree charts in direct consultation with the customer, to ensure they are tailored according to the individual’s needs and taste. “Our beautiful family tree charts are a great reward for families who have spent many hours researching their roots”, said MyHeritage.com Founder and CEO, Gilad Japhet. “Family history is much more fun when you can share what you’ve discovered with others, and family tree charts are perfect for that. We’re proud to raise the bar and provide the widest choice of customizable family tree charts on the web - that can easily be shared with others for free. Our attractive new family tree posters will be a source of pride in every home and are perfect as a gift for the upcoming holidays”. Existing users of MyHeritage.com can create their own family tree charts by simply clicking on the 'family tree' tab on their family site and choosing 'charts and books'. People who have already built a family tree elsewhere can easily import their family tree onto MyHeritage.com and take advantage of the beautiful chart options, by signing up for free on www.myheritage.com and uploading a GEDCOM file. For your Thanksgiving viewing NGS is pleased to send you two new segments from the NGS Online Video Series. Laura DeGrazia, former president of the Board for Certification of Genealogists, tells the story of how she became a genealogist and shares tales of her family and ancestors. The collection of indexes and images available on FamilySearch’s beta website continues to grow by leaps and bounds, with the addition of 34 collections of genealogical records. These records include 15 million indexed records and 2.5 million images. The bounty of information covers 13 different countries around the world: Mexico, Chile, Colombia, Honduras, Guatemala, Brazil, France, Spain, Germany, Belgium, Jamaica, Canada, and the United States. Search these records now at Beta.FamilySearch.org. New records and images. This is an index of immigration dossiers compiled by the Antwerp police force between 1840 and 1930. Presently, the immigration dossiers are only available on microfilm, so this publication allows us to reference these dossiers. New records for the following counties: Albany, Bronx, Broome, Columbia, Essex, Franklin, Greene, Hamilton, Herkimer, Jefferson, Lewis, Madison, New York, Onondaga, Oswego, Seneca, Warren and Yates. This release completes this collection. New images and records. This census was taken on a two-sided form where only one person appears on each form.